Does my Market need to be registered with the Utah Department of Agriculture and Food (UDAF)? What are my responsibilities for the safety of foods being sold at my market? The local Boy Scouts want to use my market to sell cookies they baked as a fund raiser. Can I let them? Find answers to these questions (and many more) in this FAQ created by the Utah Department of Agriculture and Food. The Utah Department of Agriculture and Food is the regulatory authority for food sold and manufactured in Utah. This means foods that are manufactured, processed, packaged, stored, transported, prepared, sold or offered for sale in the state of Utah. This regulatory responsibility also extends to food sold at outdoor market venues including farmers markets. It is the expectation of UDAF that outdoor markets comply with the same requirements that retail food stores must follow. The USDA’s Food Insecurity Nutrition Incentive (FINI) program demonstrates positive progress towards the program’s main goal of increasing the purchase of fruits and vegetables among low-income consumers participating in the Supplemental Nutrition Assistance Program (SNAP) program. FINI funding is open to multiple types of produce retailers, but incentive programs were initially tested, and have proven to be successful at America’s farmers markets. In Year one, FINI supported incentive programs at almost 1,000 farmers markets, representing 4,000 direct marketing farmers in 27 states. These farmers market programs alone generated almost $8 million in SNAP and incentive sales spent on produce. Program evaluation conducted by grantees indicated uniformly high redemption rates, strong support for the program among stakeholders, and a great deal of collaboration from both public agencies and private program partners. These collaborations were particularly important in conducting outreach to SNAP recipients. This report summarizes the results year results of 13 mid- and large-scale FINI projects that operated at farmers markets. The data and conclusions are drawn from grantee reports, information on the National Institute of Food and Agriculture’s website, and additional information provided by grantees. With farmers markets starting up across the state, the Division of Regulatory Services (DRS) wants producers to be aware of regulations pertaining to the labeling and/or registering of some agriculture commodities when offered for sale. This guide walks producers through marketing products from eggs to maple syrup in the Granite State. As of July 1, 2015, individuals can sell non-potentially hazardous (NPH) foods made in their home kitchens, without a license (Minnesota Statute 28A.152). NPH foods are foods that do not support the rapid growth of bacteria that would make people sick when held outside of refrigerated temperatures: these are the types of foods the 2015 Minnesota Cottage Foods Law exempts from licensing. MFMA has worked with the Minnesota Department of Agriculture, the Minnesota Department of Health, and the University of Minnesota Extension Food Safety Team to compile this list. The 2015 MN Cottage Foods Law is an exemption from food licensing for non-potentially hazardous (NPH) foods (aka cottage foods), as long as specific conditions are met by the cottage foods producer. This fact sheet helps markets and producers understand the law. 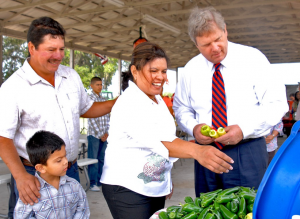 Local governments play a key role in promoting and support local food systems. In 2012, Michigan State University’s (MSU) Center for Regional Food Systems and the International City/ County Management Association’s (ICMA) Center for Sustainable Communities collaborated to understand more about the ways that local governments across America are supporting local food systems. Building off that survey research, the organizations identified four communities to feature as part of a series of case studies exploring how and why they engage in food systems development. Lobbying and direct contact with policymakers are critical components of an advocacy campaign and can be instrumental in achieving the desired policy change. Lobbying refers to asking an elected official or key decision-maker to vote a certain way or take a specific stand on a piece of legislation, rule, issue or policy. One of the most persuasive forms of lobbying is a face-to-face meeting with your elected officials or her/his staff about the issue at stake, why you are passionate about the issue, and the position you’d like your member of Congress to take. It’s important to remember that lobbying is part of a comprehensive strategy to win on your issue or achieve the policy change you want. Lobbying builds relationships with elected officials and educates them, develops leaders and their credibility within your organization or network, and sets the stage for ongoing advocacy. Lobbying also serves as a complement to network- or base-building and media advocacy – all three strategies work together to create a successful advocacy campaign. This great guide, prepared by the Center for Health and Gender Equity, will get you started with the process. In the past decade, multiple states and the District of Columbia have passed legislation to support farmers, ranchers, and food entrepreneurs while increase access to healthy food at farmers markets. Here are examples of those legislative solutions.